Low-cost. Outstanding Value! Half price car hire with this house! One of the more fascinating and less reported aspects of Crete is its incredible bio-diversity, not found on other Greek islands and nowhere more evident than in the mountain village of Elos. A short drive from beautiful beaches up into the hills at the far western �narrow� end of the island, the countryside and valleys become lush and broad-leafed and almost northern European. 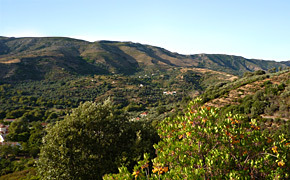 Elos sits here between the olive-grove greenery of Kissamos and the remote, often arid, near-desert conditions surrounding Elafonisi and Paleochora. 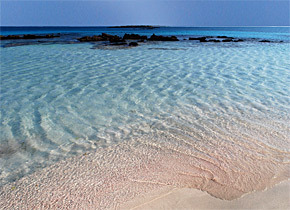 Within easy reach of the north, south and west coasts and their beaches but away from any conventional tourist development, Elos sits on the road from Xania and Kissamos to the world famous pink-sand beaches of Elafonisi. The village boasts a surprising choice of traditional tavernas, cafes and art shops, beyond what one might expect to find in a village of this size. Though busy at certain times of day in high season, Elos reverts to tradition at all other times, days and seasons when often the only sounds are the rush of water in the mountain streams and the clack-clack of dice as the older men play Tavli in the Kafeneons. There are no hotels, no tourist offices, no tacky tourist shops and no foreign housing estates! 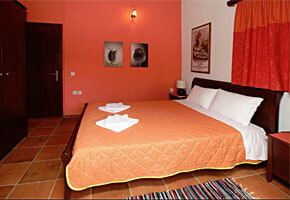 Just a few hundred metres up from the village centre we have two jewels of holiday houses � Villa Elene and Villa Hera. These are traditionally designed, brand new two-bedroom houses built from local stone, slate and timber and surrounded by high stone walls, huge trees and woodland everywhere. Each house has its own private swimming pool at opposite ends to each other and the houses are built back-to-back for maximum privacy. Only the entrance doors are adjacent to each other � useful if a large family or group wished to rent both houses together. Both Elene and Hera are almost identical in internal layout and feature air-conditioning for summer, or heating and an open fireplace, for cosy winter holidays too. The entrance door leads into the sitting room past the feature open fireplace to huge double sliding doors that open onto the pool terrace. The luxurious sitting room continues into the dining area and the fully fitted kitchen. Rising from the sitting room, the staircase takes us to the two bedrooms - a double and a twin - and the bathroom. A feature upstairs is the exposed timber boards of the sloping ceilings giving a semi-rustic feel completely appropriate to the location. The luxury of the bathroom however quickly supplants those rustic thoughts, amidst the beautiful fittings and stunning colours and patterns of the floor and wall tiles surrounding the toilet and bath. Villas Elene and Hera are decorated and furnished in contemporary colours and styles that blend beautifully with the tradition of the architecture and the location. 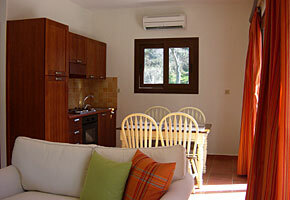 Both have multi-channel televisions, washing machines, fridge freezers and a full kitchen. Outside there are large terrace areas, gardens, pathways and easy parking. 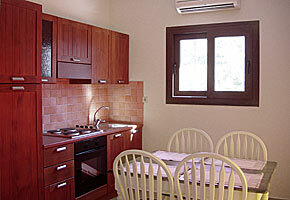 This is wonderful holiday accommodation and a location for those who want to get away from the crowds; who want to walk in the mountains as much as they want to swim in the sea; who want fresh clean oxygen-rich air and sparkling streams; who want to walk down to the simple pleasures of the local food and drink at the tavernas and cafes. Exciting, refreshing and invigorating � even for the jaded!